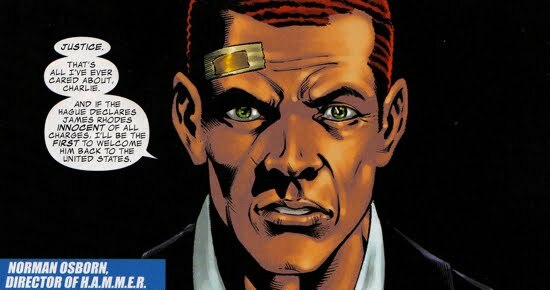 Norman Osborn had his eyes on everyone when he was in charge, so it shouldn't be a surprise that eventually hostility broke out between he and James Rhodes (aka War Machine). Their personal war began when Osborn used his H.A.M.M.E.R. forces to storm a secret facility in Colorado that housed the repro bod (a cloned body) of Rhodes, he then took it into custody. War Machine was unaware that Osborn had stolen the body because he was focused on exposing criminals and warlords across the globe. Meanwhile, Osborn had charged his Dark Avenger Ares with the task of taking down Davis Harmon (Eaglestar CEO and war criminal) in the occupied nation of Aqiria. It was in Aqiria that Ares ran into War Machine and the God of War decided to intervene with Rhodes' mission. 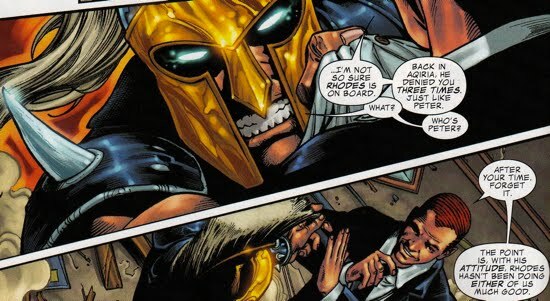 Eventually, Ares motive changed and he embraced Rhodes and his mission calling the War Machine 'his champion'. Osborn then decided to offer Rhodes and his team a deal, as long as they ended their crusade. The team was offered everything from testimony to action figures (no joke) and Rhodes was offered the repro bod that Osborn had recently stolen. War Machine declined Osborn's offer, his mission was not complete. Osborn kept tabs on Rhodes and his team, and when the group landed in Arizona during their battle with sentient killing machine known as Ultimo, Osborn requested the help of the American Eagle (aka Jason Strongbow). 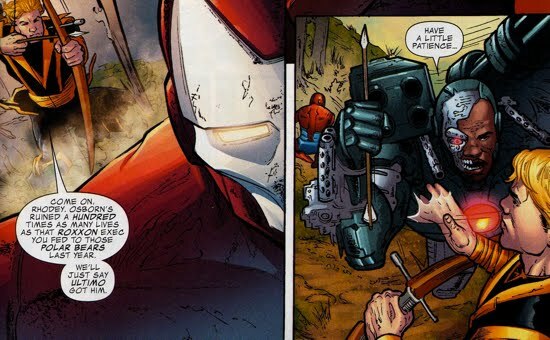 As War Machine, Rhodes broke into Mackelroy Army Base and Osborn contacted the American Eagle and asked that he intervene. 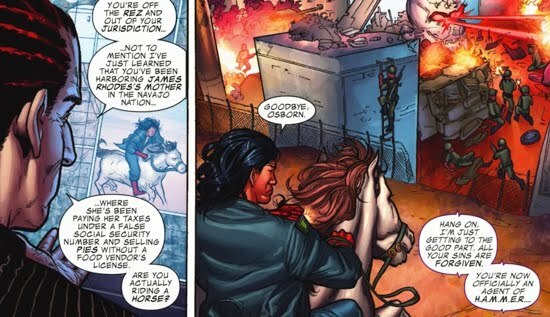 Strongbow declined Osborn's request (remember that Norman tried to kill Strongbow back when he was the Thunderbolts director), despite the fact that Strongbow didn't agree with Rhodes' tactics. Eventually the situation in Arizona involving Ultimo escalated, and Norman decided it was time to intervene. 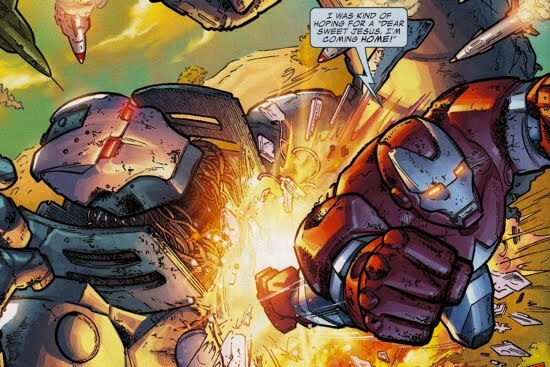 War Machine and the Iron Patriot cooperated in neutralizing Ultimo, but there was a twist. In order to defeat Ultimo, they needed to convince the machine that life was worth saving so they had to fill the machine with positive memories. 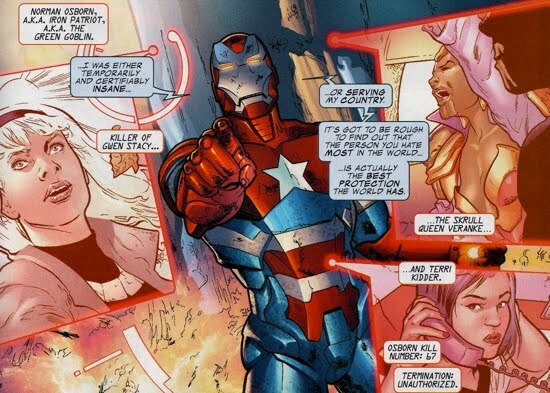 Problem was, there were only two people that could interface with Ultimo, the Iron Patriot and War Machine, and since Rhodes was the target of Ultimo's destruction he couldn't be used. So Norman had to step up and provide some positive memories...what did he chose? The birth of his son Harry, how nice! Ultimo was inspired by Norman and called off its war against life on Earth. Norman took the credit publicly for defeating Ultimo (even having a parade for himself) and he also tried to take the Ultimo technology for his own personal use. Before Osborn could steal the tech, Rhodes distracted him so that Suzi Endo (Rhodes' teammate) could escape into space with the Ultimo. While Norman reaped the benefits for the defeat of Ultimo, Rhodes continued his mission and he aimed his sights on the Bainesville Ten, a group of nefarious politicians and captains of industry. Rhodes successfully exposed these criminals and they were all indicted on a variety of charges. To counter the negative publicity created by Rhodes, Osborn decided to place War Machine on trial for war crimes and crimes against humanity. The trial was to take place in The Hague. Secretly, Endo released drops of Ultimo tech back into Earth and sent them after the Bainesville Ten, who Osborn was trying to free from custody. 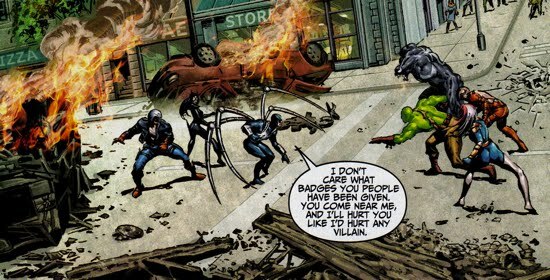 Before Rhodes can see trial, his team along with Osborn's Avenger Ares freed Rhodes from incarceration. 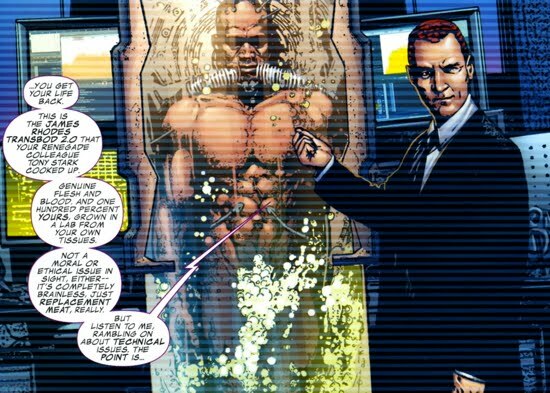 Osborn cooks up a story for the public that Rhodes' villainous cyborg body was created by Tony Stark and that Osborn had found the 'real' body of Rhodes and absolved it of all charges. 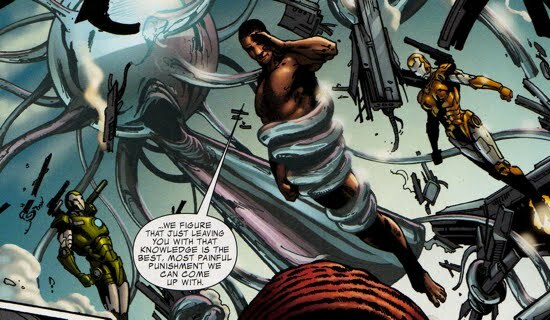 War Machine's team wirelessly transferred Rhodes brain/memories into the repro bod, which breaks containment after beating up Osborn. Rhodes using the Ultimo tech to fill the Bainesville Ten's brains with the horrid memories of their actions, driving them mad and he left Osborn with the unsatisfying feeling that Osborntech had failed. Rhodes than went off to enjoy his second shot at life. Rhodes got his repro body and Osborn was outsmarted. 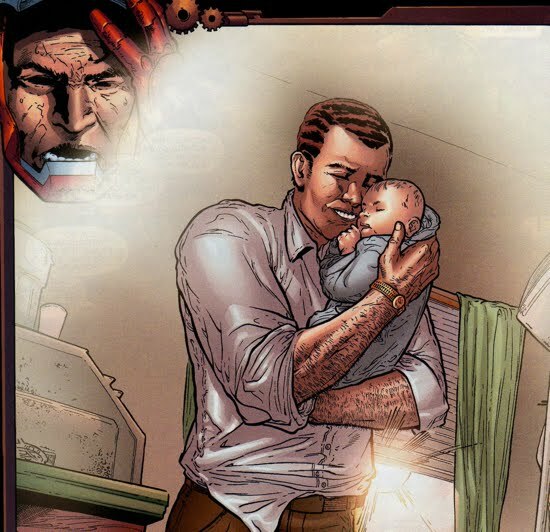 The two didn't meet again while Osborn was in charge, but they'll certainly see each other again in the future. Chalk up another defeat for Norman. Lots of them here, let's get started. We all know that Ronin was the major proponent of just killing Osborn once he got into power, he had his chance here but Rhodes stopped him...interesting. Wonder Man kicking Norman while he was down...good thing Norman got him placed in jail after Wonder Man's involvement with the Lethal Legion. Couple of Christian references from Osborn, he did this a lot throughout his tenure at the top. Norman's fond memories from his past, the birth of his son Harry. Here's a cropped version of the panel. I wasn't quite convinced that Harry's birth should be such a positive memory for Norman, we all know that Emily died shortly thereafter and that her death was associated with Harry's birth. I would contend that Harry's birth would be a negative memory...however, stealing Peter Parker's newborn would be a positive memory.